When you order a delicious pizza, you may be tempted to eat the entire thing in one sitting. But, sometimes the size of our stomach prevents us from indulging that much. 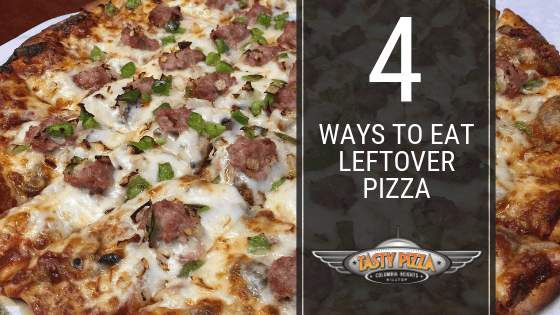 But don't worry — there's more you can do with your leftover pizza than just eating it cold or reheating it in the microwave. Read on to learn four amazing ways to use up your leftover slices of pizza. If you've been looking for an excuse to buy a waffle iron, this will surely push you to do it! Use two slices of pizza, pressing them topping-side together. Stick your mini pizza sandwich in the waffle iron, and soon enough you'll have a perfectly crispy, gooey, delicious treat! When you reheat pizza in the microwave, it loses its crispiness. When you cook it in your waffle iron, you'll still get that great texture. Now, who says you can't eat salad and pizza at the same time? Leftover pizza from Tasty Pizza is perfect to make croutons. Since our slices are already cut into squares, you can easily slice it up to make croutons. Cut your leftover pizza into bite-sized pieces and bake them in the oven until they turn nice and crispy. These croutons would also taste amazing in several different soups. If you have a panini press, you have an easy way to make a savory meal or snack. Press two slices of pizza together and cook them in the panini press until they stick together. Whatever toppings you have on your pizza will make for a delicious treat. Depending on how much leftover pizza you have left, you can use it to make a brand-new meal for the entire family! If you don't have any special kitchen gadgets around your home, you can still make something great out of your leftover pizza slices. Make an excellent breakfast for dinner by adding your favorite breakfast foods to your leftover pizza. Put on some breakfast sausage, bacon, extra cheese, scrambled eggs — or all of the above! Just be sure to pop it in the oven to reheat it, so the crust gets its crispiness back. Whether you're making this in the morning before you head out to school or work or as a breakfast for dinner type meal, you're in for one delicious treat. Leftovers are awesome — you really can't deny that. You're getting another delicious meal without having to cook again or buy another meal out. But, sometimes we aren't in the mood to eat the same thing two days in a row. Whenever you have leftover pizza from Tasty Pizza, get creative! With these recipes, you can really amp up the already delicious pie from our restaurant. After you start trying out some of these ideas, you may want to branch out and try out your own unique ideas. Check out our menu and place an online order for your next pizza from Tasty Pizza today!